• For Optimal Use: Suggest use a 5V 2amp current AC adapter,especially charging to Galaxy S6/S6 edge ,otherwise the charging process may be disconnected or charging slowly. 4. The newest chipset technology that keeps the charger cool, also improves the efficiency of the charger. Eliminates the need to use charging cables and plug adapters. It will be begins as soon as you place down any Qi-enabled devices. 1 amp charging coil make the charging be fast. Stylish square designs and big Qi charging area ,make the devices be putted on perfectly and safely. Simple. ...plug in the charger, lay your wireless charging phone on it, and they you go! Simple easy perfection. It charges rapidly and simply. I purchased this item at a discount for my honest opinion and review. GREAT PRODUCT! Love this charger. Fast shipping. Thank you so much. I bought it again for my wife's Galaxy S6 Edge Plus. Easy to charge and speed is not bad. Charging light is good as night light. Love it! Charging port on my Nexus failed and I thought I'd have to buy a new one until I discovered this great charger. I just lay my Nexus on the Orchid and it fully charges it over night. Worth every penny I spent on it. I've purchased a few of these wireless chargers in order to provide reviews. This charger works great with my Galaxy S6. I did receive this product at a discount in exchange for an honest review, however, with the technology now built into a lot of phones, I was buying this anyway. 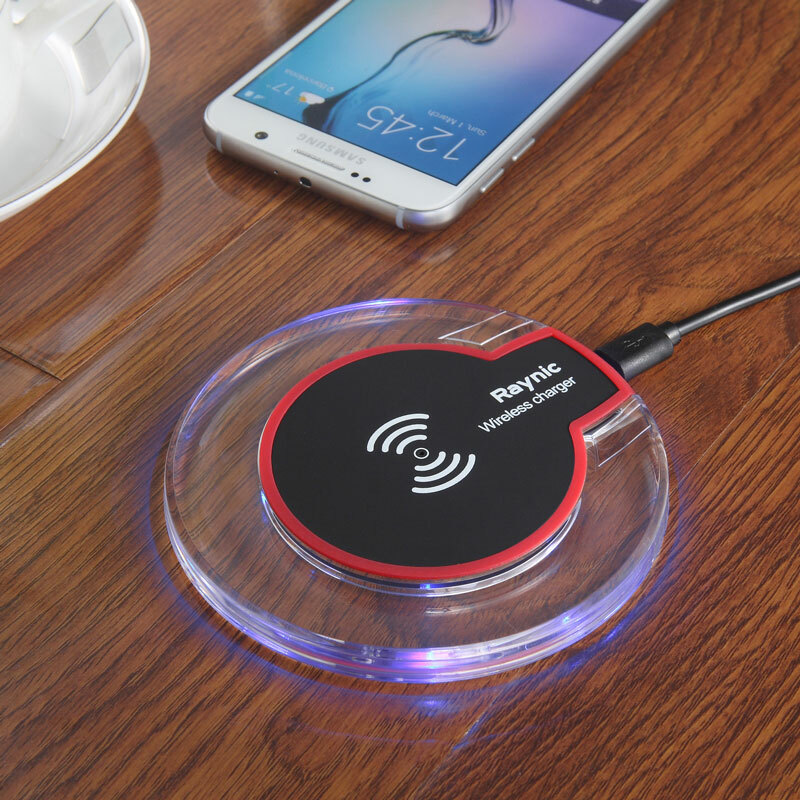 Dump that cord and get your phone charged wirelessly! Has a nice blue glow when charging,, I can tell where the coils are on my device so figuring out placement is easy. It's well constructed, doesn't feel cheap but it sometimes run hot for my LG G3, although that could as well be the fault of the sticker. I'm currently using it between two devices, a HTC Droid DNA and an LG G3. The center of the device emits a red LED when not charging so I can find proper placement at night, which is a plus-- I don't have to stumble for correct orientation. 4 stars because it runs hot. Although I've received a discount for this item, my review is completely unbiased. Cute and convenient. It's great that I don't have to be bothered with plugging in my phone to charge it! It doesn't take up a lot of space and it sits on my desk without being a distraction. I received this product at a discount in exchange for my honest opinion on it. I got this for my iPhone 6 Plus because it would really be awesome to be able to charge my phone wirelessly. It's really easy to use. Just plug it in and wait for the red light to turn on and place your phone on it. Charging time is a little slower then my wall charger but it's not really a big concern for me. Pretty simple and makes charging my phone easier and hassle free. I received this product at a discount in exchange for my honest and unbiased review. This works perfect. Just like it says. My Galaxy S6 works well with it. I received this item at a discounted price to leave my honest review. Great wireless charger, works great. I got this for my husband, so was wanting one of these to charge his phone, which I have to say it pretty cool and I like it. Although my phone can not use this or it's not up to this little devices standers. My husband has the note 5 which is capable to use this wireless charger. This is slim and lightweight, simple to use and great for when you are on the go. It keeps the desk or its location organized and clutter free. This is a nice looking charger and charges his phone quickly. He has not lost any connection or has seen any slow charging. It connects and disconnects automatically. I was able to get this at a discounted price for my honest review and this is solely my own. Works great and charges fast. It is very simple and easy to just lay your phone on this to charge it. Flashes Blue when on correctly and charging! I've had other wireless chargers and typically, you have to move them around a little to find the sweet spot-Either a beep, noise or light shows you are in the correct zone to leave it to charge! This one gives off a little flashing blue light that is a little difficult to see-for these reasons, I gave it four stars! You can plug it into your PC USB port and charge your phone or tablet if QI enabled to charge right there! I received this at a discount or for free in exchange for and honest review. Terrific! A nice piece of equipment! Wireless phone charging! This is great. The charger is small, looks good sitting on the table and charges my phone great. I'm new to wireless charging but it was easy to add a card onto my Samsung Note phone battery and start charging with this handy device. I have always hated the micro USB connector and how difficult it can be to orient the cable properly. This device is doing a fantastic job of charging without having to deal with the cable and worrying about tearing up my phone if the cable gets inserted incorrectly or jerked out by one of my kids... I recommend this to anyone who can take advantage of wireless charging! I received a discount on this product in exchange for my open and honest review. It is well worth the asking price! I purchased this wireless charge pad in exchange for a review. after using it for a day, I am in general happy with it however I wish it came with a wall charger not just a very short USB charge cable. I am happy with the large surface area of the charger but wish it was a little stronger as it does not charge thru all the different cases I have for my s6. Very nice charger I like that it will charge thru my phone case . Fast an no more messing with wires to plug in the micro usb port. Also looks very nice an well made. I received this product at a discounted price for reviewing the item. I received this item at a discount in exchange for an honest review. I unpackaged this, plugged it in, and set my note 5 on it. Without having to do anything it instantly started charging. Very easy to use and charged my phone yo a full charge in about 30 minutes. Great product and very well made. This is a pretty nice charger, very sleek and elegant & at a great price. My only issue is sometimes it's difficult to position my phone on it to get it to start charging. I always have to really center it & take my phone case off since it doesn't really charge the phone with it on. I dont speak english well. It works good. Happy to have it. Charges fast. The clear part allows you to know if it is charging from any direction. So far so good. It's not the most powerful as I have to take the cover of my Nexus 7 from its cover in order to be able to charge. Time will tell about durability. Really works nice with my LG G2. Nice but a bit tricky. Work well. Sometime it gets too hot. I purchased this wireless charger and it works great with my Note 5. I don't use the charging cable that came with it cause it #1 cause it's to short & #2 it charges to slow so I use my Samsung charging cable from my previous Samsung phone which charges my phone much faster. I have never had problems with the device or the phone getting hot. it works better than expected! I was honestly a bit skeptical of it but I was pleasantly surprised. It does take longer to charge my phone on it but when I use it to charge my phone overnight it is ready by morning. It was nice to wake up and be able to lift my phone without pulling on the cable or dropping something else on the table. Looks good and actually works! Arrived just as described. Charges pretty fast, looks good on my nightstand! I was purchased for free via the promotion . ,, Design is good . ,, There is a pad on the floor , it does not move goods . ,, Heat is not generated in the charger . ,, Charging I think one slow -thirds than the charging cable . ,, Even if you did not buy for free , it is a trade favorite. Works great, very simple and very inexpensive! I received this product for free in exchange for an honest, unbiased review. I was really excited about this! It seemed to work alright Even my Galaxy S6 got a case on, performance drastically decreased. The positioning has to be just so in order for the device to charge. Really worth it. Easy to operate just place it down and it works with my Galaxy S6 . I have been using this charger at work since I received it. It's working great and it has awesome slim design. Very easy to use and It makes my life so easier. Just place my cell phone on it then it get charged. Pretty easy to use. I cannot go back to the world of charging cables. I bought this for my wife and it works perfectly with her new Samsung Galaxy S6 Edge. When I presented it to her, she was amazed at how easy it will be now to charge her phone. I had always wanted a wireless charger but just couldn't quite justify it.it looked nice and stylish - a nice looking wireless charger to have setting out on the night table. not bulky,and charged phones quickly with no interruptions. 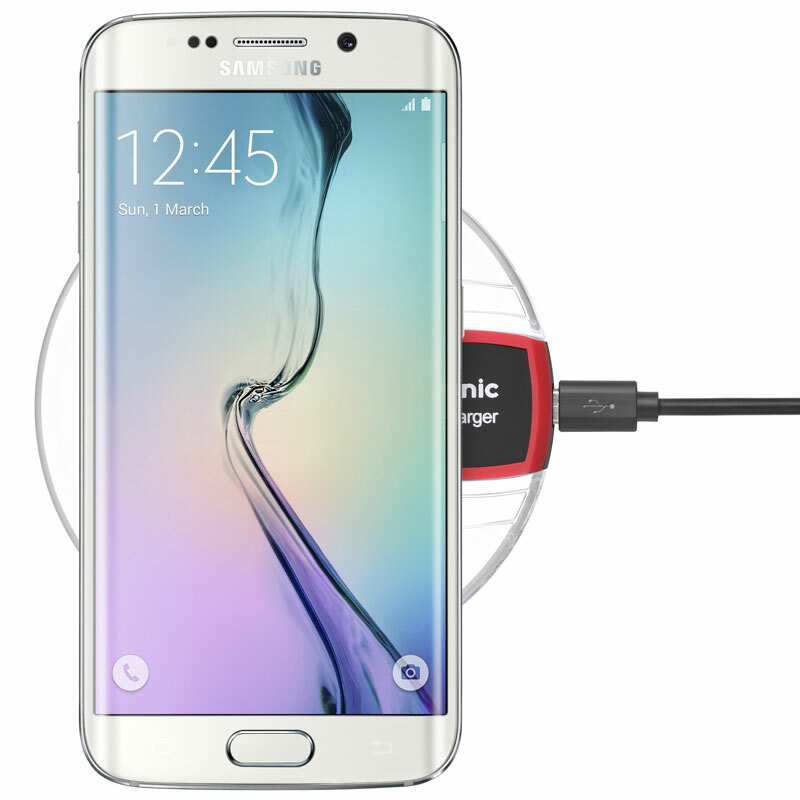 It charges quickly using it and USB cable that came with my Galaxy S6 as the power source. Every so often it will toggle between charging and not charging over and over again but moving my phone half an inch in any direction sorts that out rather quickly. Works as advertised,If you have a big, thick case like the otter box defender you will have to remove the outer rubber layer to ensure good, consistent charging. I can get my phone to charge with the case fully on but it's finicky and just easier to take the rubber off the case when charging. This is not a problem limited to this charger but seems to be a general limitation with qi charging and effects all chargers. So far so good. Bought to replace a previous qi charger that lasted 1 weeks. This one seems better built and there's no moving the phone around to find a sweet spot. Charges faster than I expected. A good looking and useful product. This charger works great with the S6 - had their other charger unit and needed another one for work. Saw this unique design and decided to give it a try. 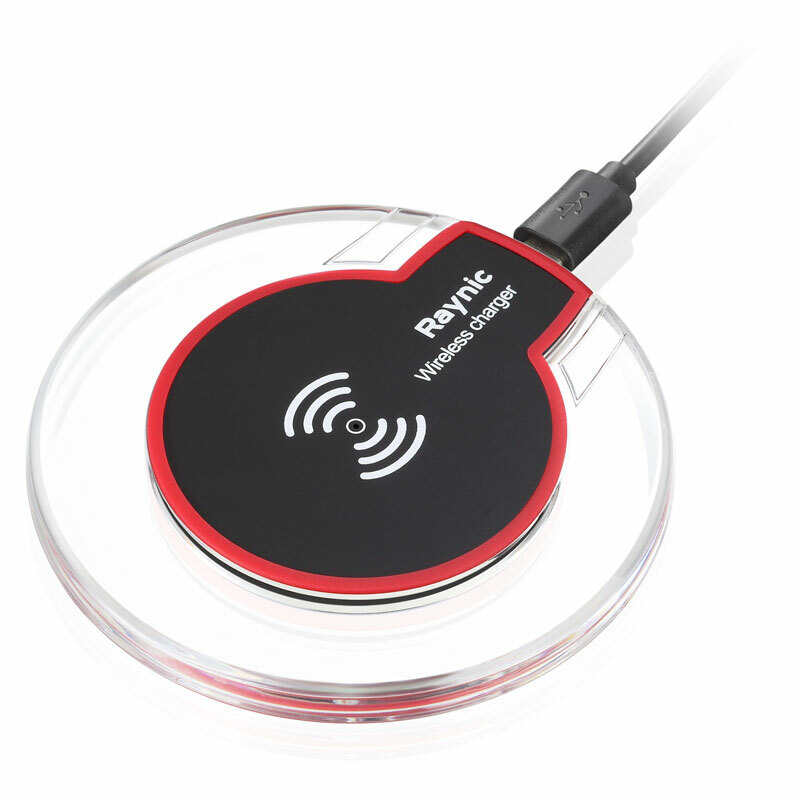 Another great charger from Raynic. Highly recommend. 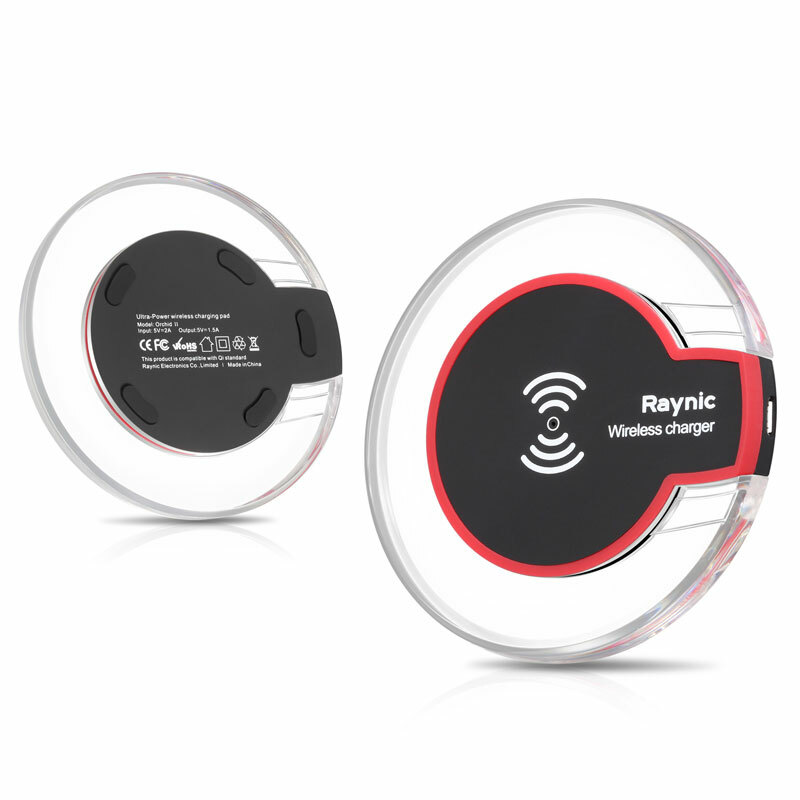 if you are looking for a QI charger and you want a slim easy to use design the Raynic Orchid series charger is a great choice. If you have been looking for a way to organize your power cables this little charger may be the answer for your phone. This charger is really small for all that is does, now I can just set my phone on top of the charger and pick it up when it is done charging. I like that it does not need me to plug it in since I am always worried about the charging port wearing when I get a new phone. That is not a concern with this new QI charger. One key point is that this charger does not come with an adapter so you will need to get a QI adapter for your device to use this charger. I picked up a QI wireless adapter for the Iphone6 for six dollars, connected it and slid it inside the case and problem solved. I do have a couple of small issues with my iPhone and case, but they are inherent for all QI wireless chargers not just this one. One is that I cannot charge my phone in the car without taking the case off and unplugging the QI adapter with an Iphone, other phones have the QI adapter inside the phone next to the battery so this is not an issue. The second is that I had trouble connecting with the charger with my original case because it was a thick case. As long as your case is silicone or plastic and it is a slim design you should not have an issue with this. So if you have been looking for a QI charger for your device and you want a slim easy to use design the Raynic Orchid series chargers will be a great buy. Received a free sample for evaluation and unbiased review. 5.0 out of 5 starsA good looking and useful product that is well priced on Amazon. My Samsung Galaxy S6 Edge phone charged through the phones bumper case and emitted a bleep to indicate it was charging. While wireless charging is slower it was fully charged when left overnight which is how most people are likely to use it and neither the phone or the charger got hot. A good looking and useful product that is well priced on Amazon. I only just received my charger 5 days ago.but so far it works as expected.It charges pretty quickly. No searching around for a 'sweet spot' to get it to work. I just plop it on there vertically or horizontally, as per the instructions, no hassle, wireless charging. This is a nice, solid wireless charger. This is a nice, solid wireless charger. I used this with the Galaxy S6 and found it to be a great fit. it worked great. I'd put my phone (a Samsung S6) on it at night before bed, and my phone would be charged up the next morning. I'd also occasionally use it during the day if my battery was low, and it would charge my phone reasonably quickly, though not quite as quick as wired charging. Its much simpler, just place it on the pad and it seems to charge just as quickly. I've tried it with several different cases as well and it still works. It is very convenient to use and it has become second nature for me to just place my phone on the charger once I'm home. The charge time is longer than a wired charger but in my experience I get a full charge within 2 hours. The design is elegant and simple and it looks nice resting on my desk. I just placed my phone on top of this charger and boom, in the morning it was all charged. 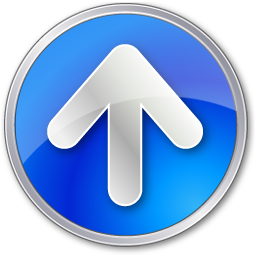 Great product!I give it 5 stars and recommend it highly! This is an excellent comfortable Qi charger. This is an excellent comfortable Qi charger. It's very easy to find the sweet spot for my Galaxy S6 Edge ,charge speed is quite fast.I have it at my desk at work so I can put my phone on it when I'm not using it. Even though I'm very happy with my phone's battery life I still like to keep it charged as much as possible. This pad will help me to do that without wearing out the micro-USB port on my phone. This charger works with my Galaxy s6 edge. This charger works with my Galaxy s6 edge. Also I have a TPU case and it charges through that. Didn't come with a USB wall plug thing but that's not a big deal. Using this with a Galaxy Note 4 equipped with an Qi Wireless Charging Receiver Card and I have to say I’ve been very impressed. Works great with my Samsung Galaxy S6 and the charge speed is very fast . Works great with my Samsung Galaxy S6 and the charge speed is very fast . The LED indicator light lets me know if it's working ,it's very comfortable even in darkness. Love the product - seems well made and works fine. I bought it for a Samsung Galaxy S6 and it charges the phone relatively quickly - actually faster than my S5 charged with a cable. . The price also seems good - especially compared to the original Samsung charger. what a unique and stylish charge pad! what a unique and stylish charge pad! It charges flawless to my iphone 5s which comes with a qi receiver.No overheating and quite fast , charges my iphone 5s from empty to 100% only 2 hours.Most importantly the charging indicator blue light is very very soft for me put this guy in my bedroom . will the charger turn off when the phone is fully charged? can I place 2 qi chargers next to each other? Or will they interfere with each other? Of course you can , they are not influence each other even be placed closely. Will this work for the Note 5? Works for lg g2 (at&t)? Does the device come with a micro USB power supply cable ? The charger that i got only lights up red and stay reds. Does it mean its defective since it never lights up blue? This is a Qi charger. If you use the 2 amp wall plug, it will likely work. I have no experience with the Turbo. will it work with Samsung Galaxy S6 active? do i have to keep the Qi plugged in to charge? I have lg g4 with verus case wallet, can i charge it without removing the case? will this work on LG G4? Is there a way to switch off the LED lights? Can you place two phones on the charger at once? Very interesting question.But it's no way to place two phones on the charger at once because the pad size is small and the charging area is limited . If you make them be stacked，thickness leads to the second one may not be get charged . Does this work with LG G4? Can this work with the Nokia Lumia 735? do this work goood for Galaxy s5 ? So sorry for the late response because of the weekend. Our product work good for Galaxy S5 if it attached a qi charger receiver . Can it charge through an Otter Box case? Our charger can charge the phone with cases, but the cases shouldn't be metal . If the Otter Box Case which you use is plastic or silicone ,and it should be not very thick . It could be use . But for optimal use , we suggest you remove your Otter Box Case when charging .